Mt. Misen is located behind Itsukushima Shrine on Miyajima. It rises from behind shrine at sea level to 529.8 meters. Its interesting geology, virgin forests and unique wildlife make it popular hiking destination. 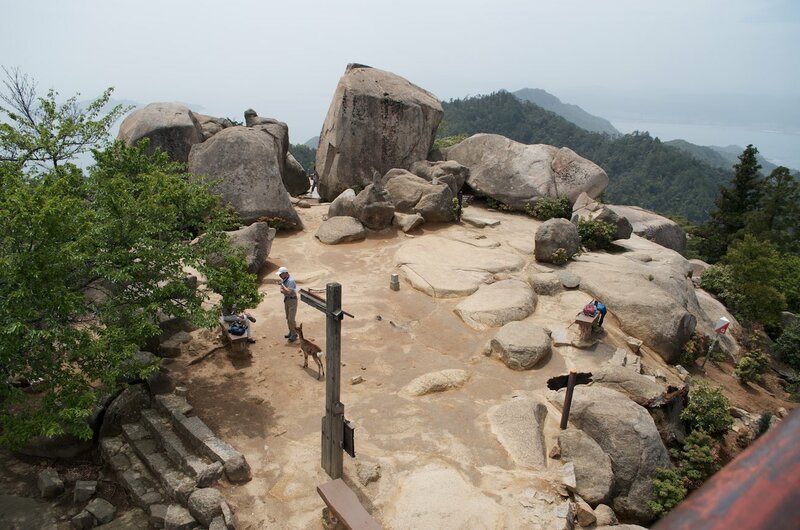 It takes over 90 minutes to hike from the town to the summit of Mount Misen. 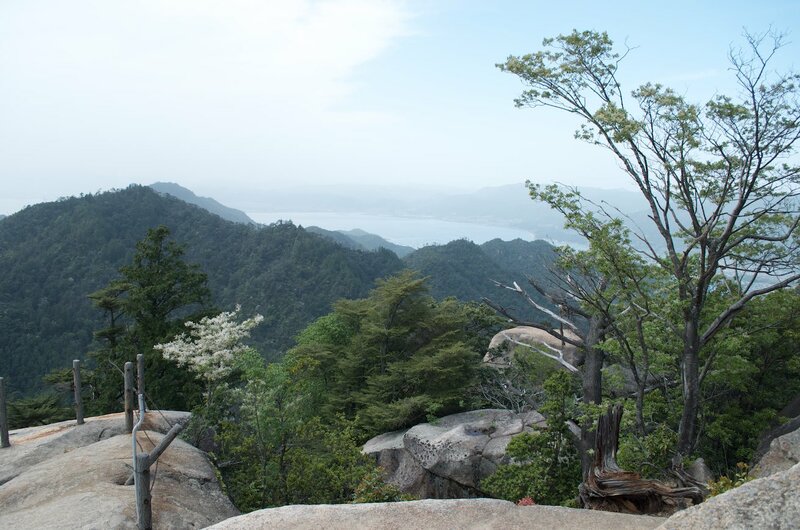 There are three hiking trails: Daishoin course, Momijidani course and Omoto course. 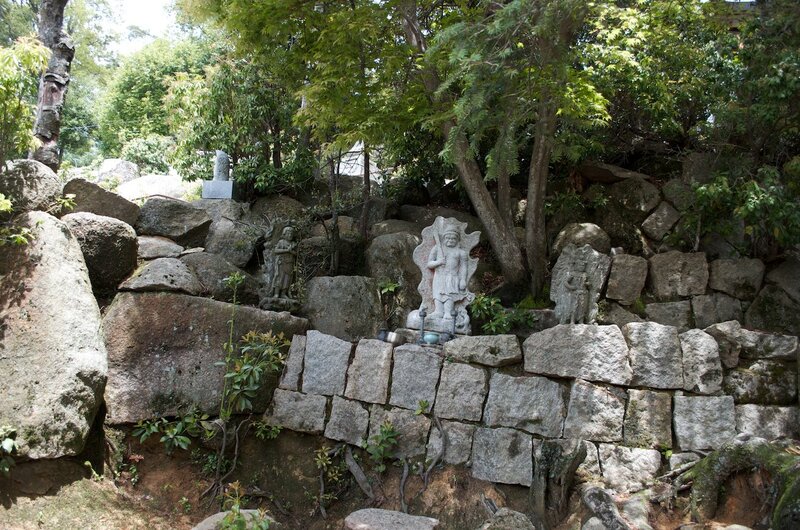 The one shown in on this webpage is the Daishoin course that leaves town on the west side of the Daishoin Temple complex. If you take the Daishoin course then you can wander around the Daishoin Temple complex before you go. This Buddhist temple is the headquarters of the Mimuro Branch of Shingon and the administrators of the Itsukushima Shrine. The complex was rebuilt after a fire in 1888 destroyed everything except for the Daishido Hall. 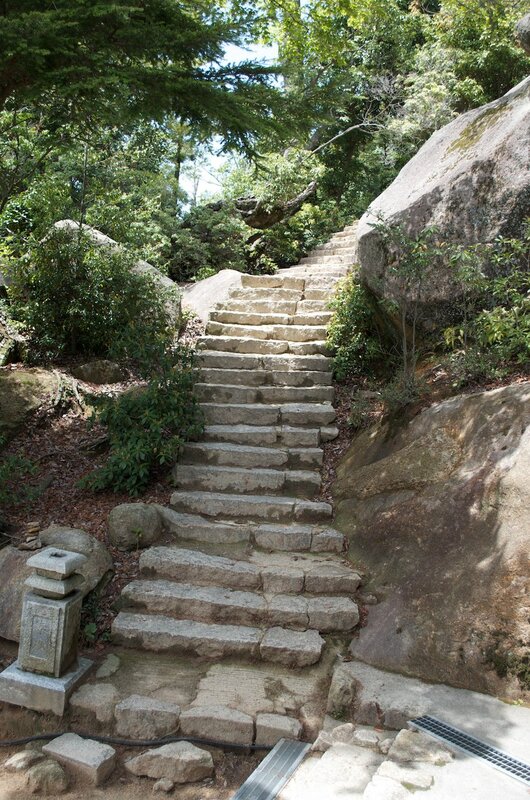 The hiking on the Daishoin course is, for the most part, not too hard as the trail is basically a series of stone stairs which weave up the mountain. If you can climb a few thousand stairs then you'll have no problem. Immediately after the temple complex is the Shiraito Falls. 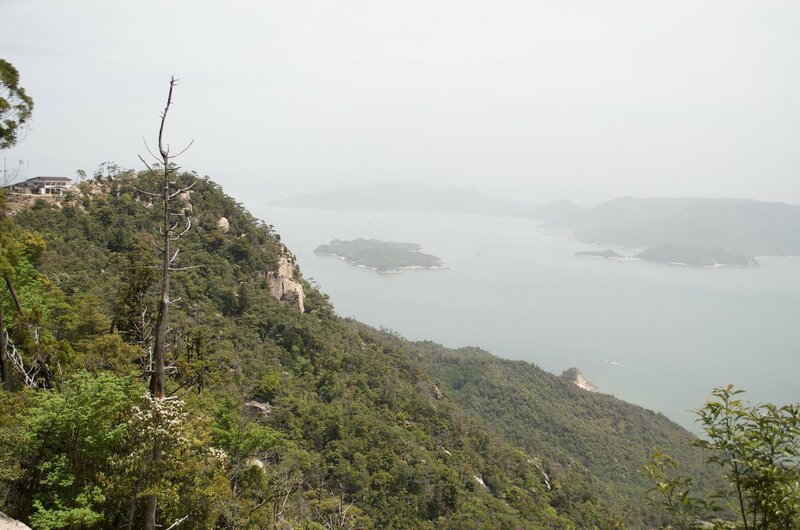 There is also a few benches and small picnic shelter overlooking the town of Miyajima you can reach on this trail with only 20 minutes of hiking. It is a perfect spot for a mountain picnic. The area near the top of Mt. 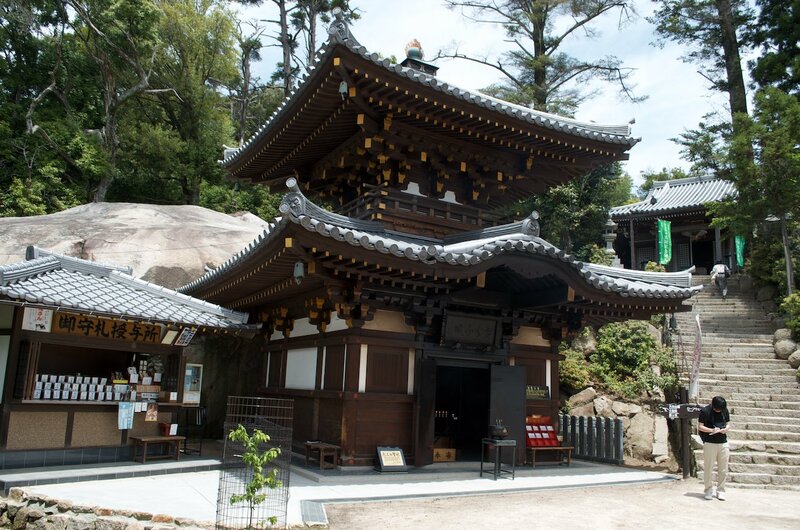 Misen contains the Okunoin Temple, Niomon Gate, Miyama Shrine, Dainichido Hall, Reikado Hall, Misen Hondo and Shankido Hall. Misen Hondo is located a short distance from the summit. 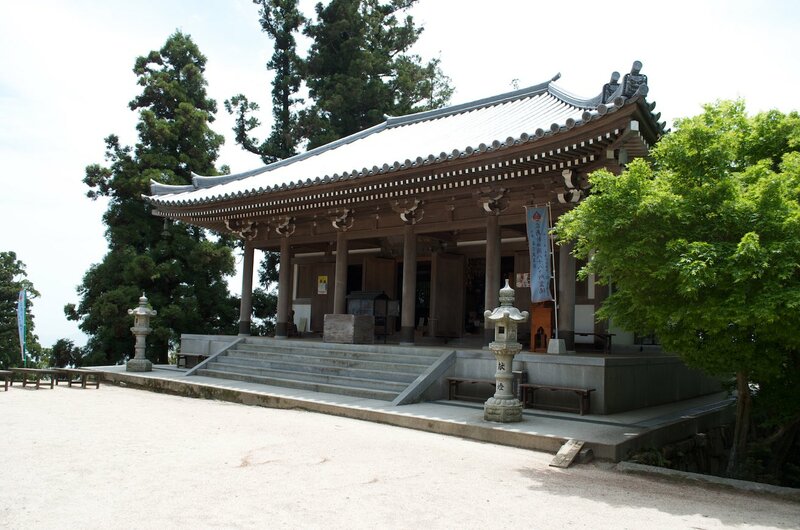 It is one of three places in Japan the rituals of Tantric Shingon Buddhism is taught. Enshrined in the temple is Kokuzo Bosatsu, the deity of limitless luck and wisdom. 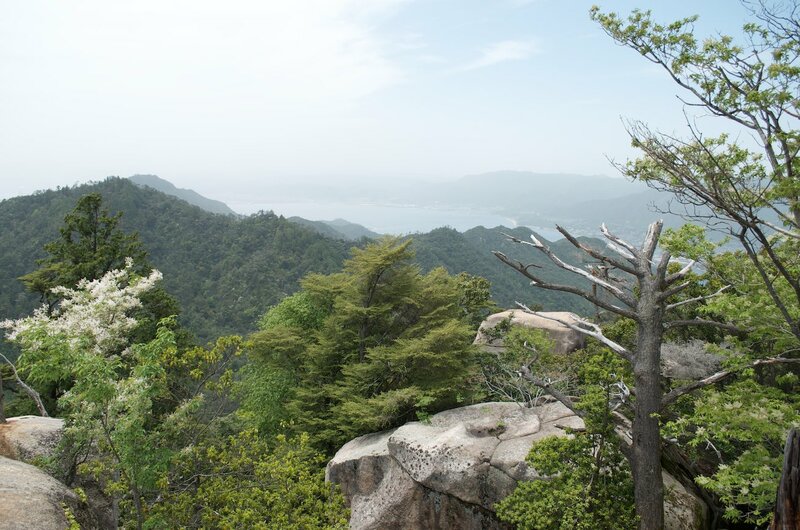 The Okunoin Temple is perched over the cliffs in the east and overlooks the Inland Sea. 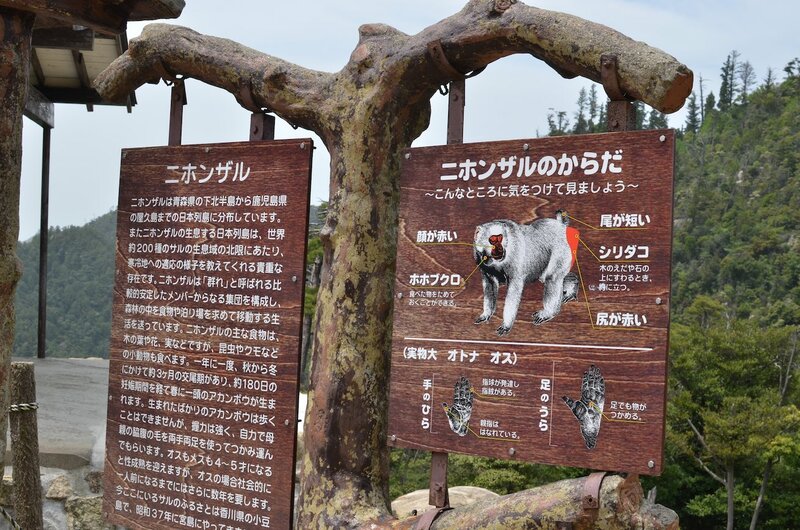 The vermillion wood temple is sometimes visited by Miyajima's monkeys. The summit of Mt. 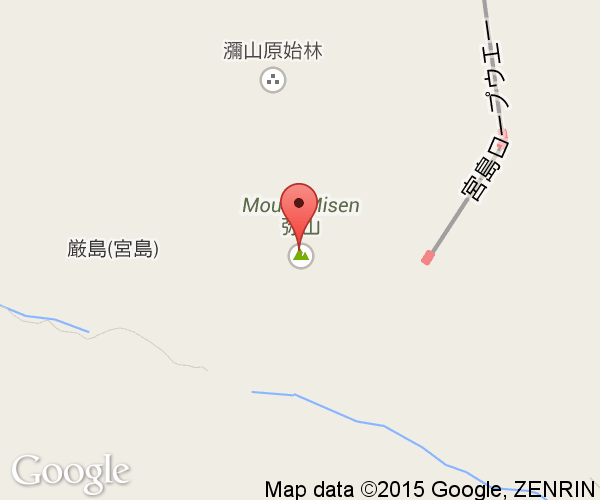 Misen is 529.8 meters above sea level. A good hiker can reach it well within an hour and a half. 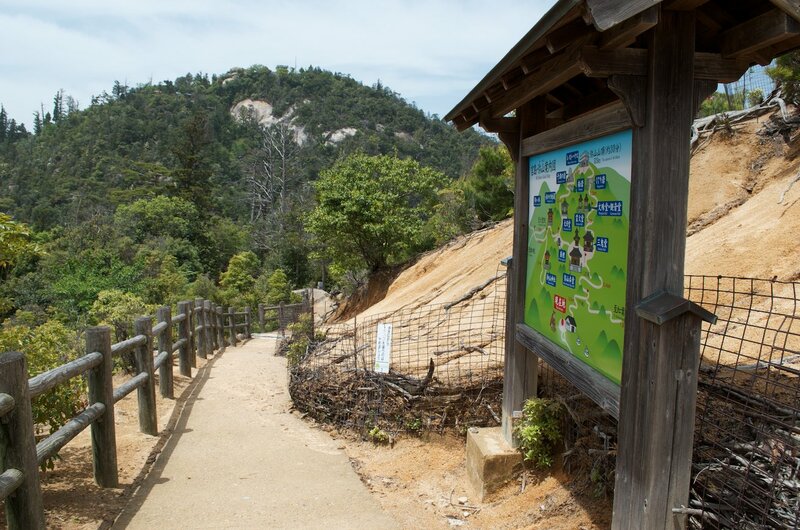 You enter to the top by winding your way through an interesting series of rock formations to reach the Mt. 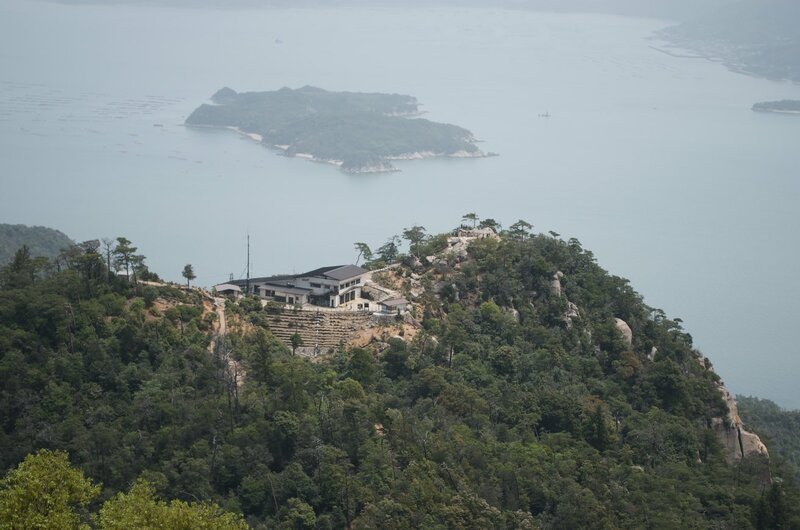 Misen Observatory/Rest house, the ugliest building on Miyajima, and the best view of the Seto Inland Sea you will likely ever see. You can also cheat and take the ropeway to a peak near the summit from the town. There is a fairly decent restaurant at the ropeway station where you can enjoy a meal while looking out at the Seto Inland Sea. 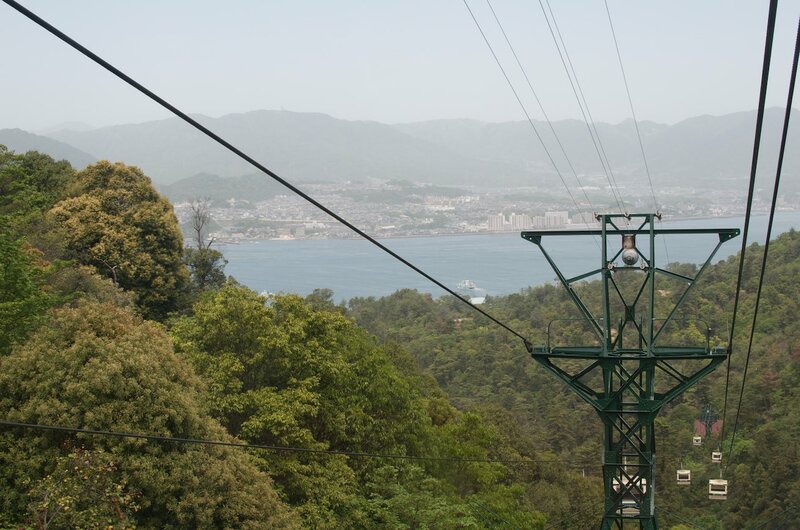 It takes about 15 minutes to hike between the ropeway station and the summit of Mt. Misen. If you're skeptical about Mt. Misen's spiritual power then looking at the seven wonders will likely convince you. Kiezu-no-hi - For over 1,170 years this sacred fire has burned. Shakujo-no-ume - Kobo Daishi's plum staff liked where he left it and it sprouted roots and leaves. If the staff turned tree doesn't bloom its double blossoms in the spring it is considered a bad omen. Mandala Rock - Kobo Daishi carved Buddhist sutras in Sanskrit and Chinese into this large rock. Kanman-iwa - A rock with a hole which is said to be filled with salt water during high tide and drain out during low tide. Shigure-zakura - It is always damp like after a shower under this cherry tree. Ryuto-no-sugi - Ryuto, a phenomenon where lights appear on the sea, is best visible from this cedar tree. Clapping wood sound - A Japanese goblin called a Tengu is said to clap wooden clappers at midnight somewhere on the mountain. 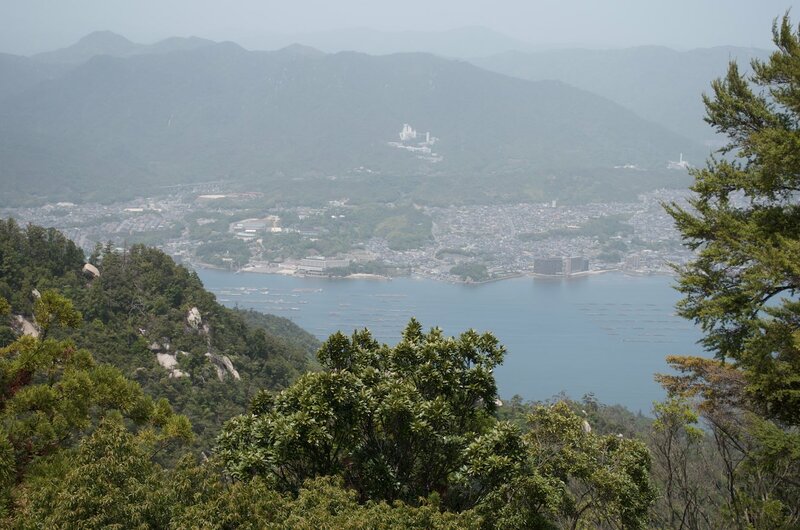 Mount Misen is on Miyajima (Itsukushima). There is a regular ferry service from Miyajima-guchi and from Hiroshima's Ujina Port. See Miyajima for more information.